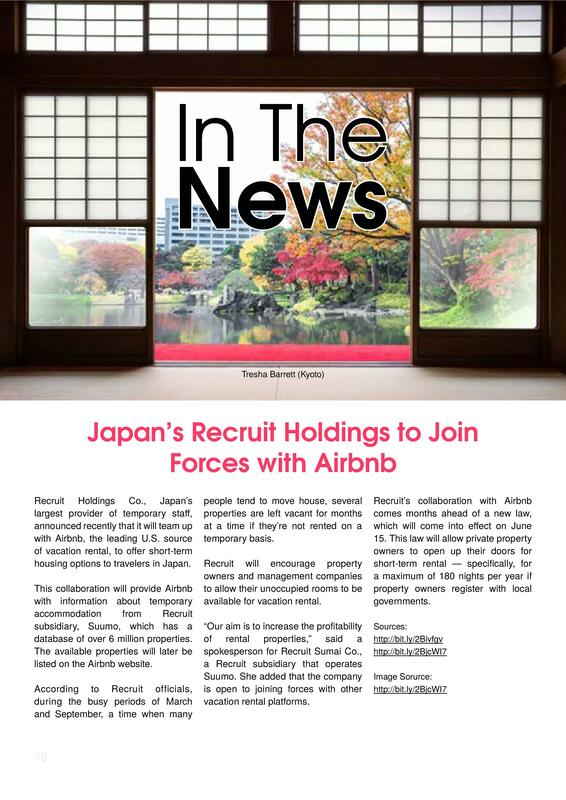 Recruit Holdings Co., Japan’s largest provider of temporary staff, announced recently that it will team up with AirBnB, the leading U.S. source of vacation rental, to offer short-term housing options to travelers in Japan. This collaboration will provide AirBnB with information about temporary accommodation from Recruit subsidiary, Suumo, which has a database of over 6 million properties. The available properties will later be listed on the AirBnB website. According to Recruit officials, during the busy periods of March and September, a time when many people tend to move house, several properties are left vacant for months at a time if they’re not rented on a temporary basis. Recruit will encourage property owners and management companies to allow their unoccupied rooms to be available for vacation rental. “Our aim is to increase the profitability of rental properties,” said a spokesperson for Recruit Sumai Co., a Recruit subsidiary that operates Suumo. She added that the company is open to joining forces with other vacation rental platforms. 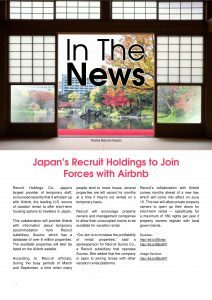 Recruit’s collaboration with AirBnB comes months ahead of a new law, which will come into effect on June 15. This law will allow private property owners to open up their doors for short-term rental — specifically, for a maximum of 180 nights per year if property owners register with local governments. 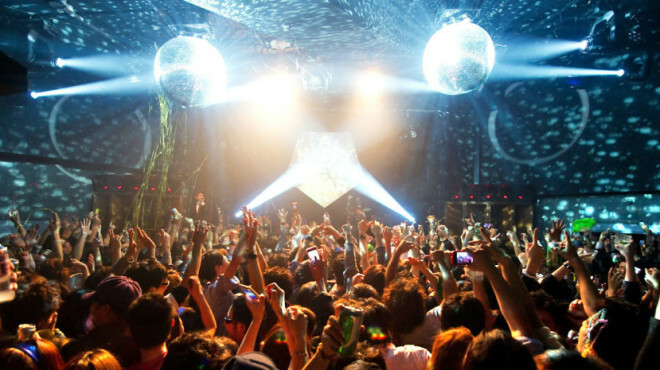 In an attempt to capitalize on the number of foreign tourists entering Japan, the Tokyo Metropolitan government will be conducting a targeted survey to find out what visitors enjoy about the city’s nightlife. 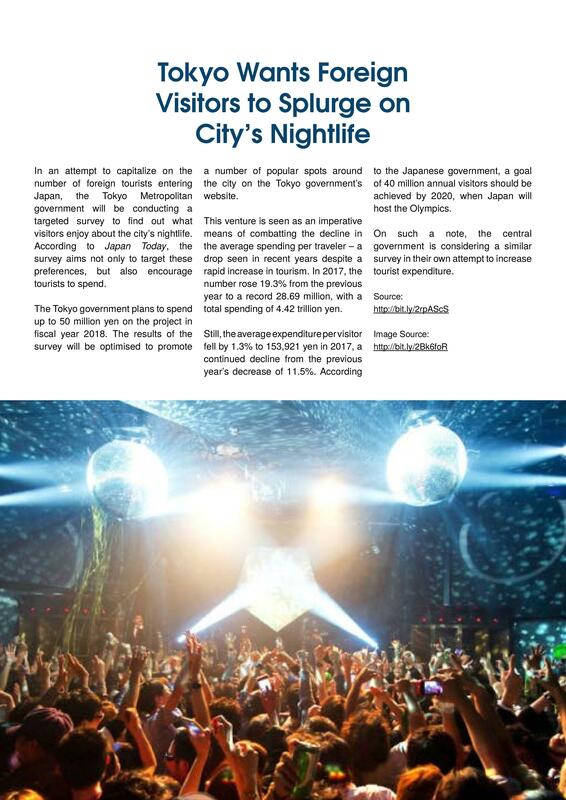 According to Japan Today, the survey aims not only to target these preferences, but also encourage tourists to spend. The Tokyo government plans to spend up to 50 million yen on the project in fiscal year 2018. 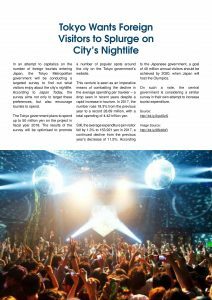 The results of the survey will be optimised to promote a number of popular spots around the city on the Tokyo government’s website. This venture is seen as an imperative means of combating the decline in the average spending per traveler – a drop seen in recent years despite a rapid increase in tourism. In 2017, the number rose 19.3% from the previous year to a record 28.69 million, with a total spending of 4.42 trillion yen. 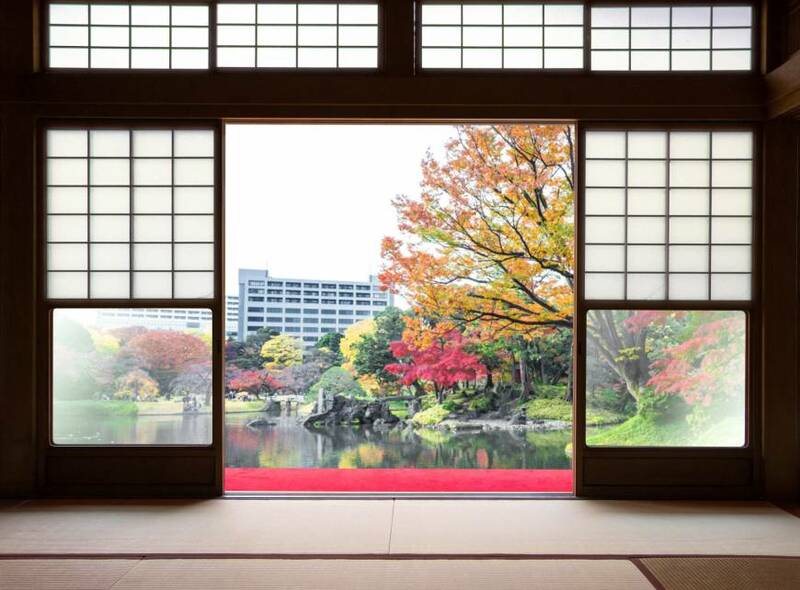 Still, the average expenditure per visitor fell by 1.3% to 153,921 yen in 2017, a continued decline from the previous year’s decrease of 11.5%. According to the Japanese government, a goal of 40 million annual visitors should be achieved by 2020, when Japan will host the Olympics. On such a note, the central government is considering a similar survey in their own attempt to increase tourist expenditure. ← Gynecology in Japan – Just Do It!